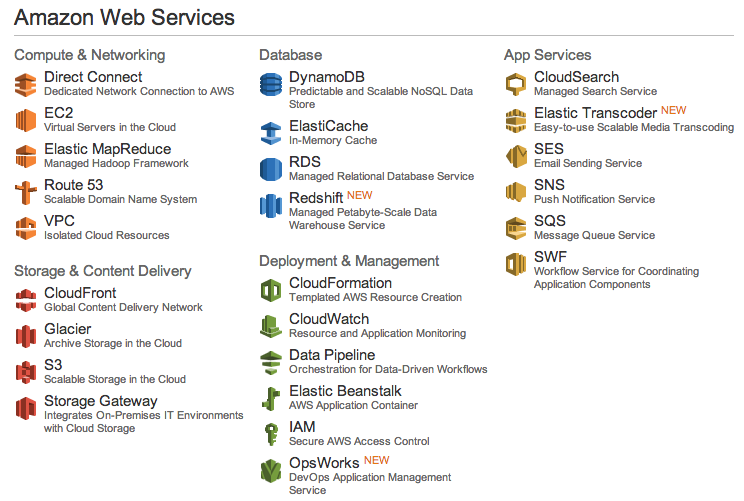 This post is intended to be a very simplistic post on how to get you started with Amazon Cloud (AWS) with a VM. It will allow you to start experimenting AWS, without any costs (if you take the right steps). Naturally Amazon itself provides more detailed steps here. credit card – though you actually need to input credit card details, you can indeed run a free VM in a limit amount of time. Amazon will simply not charge you anything for it, as long as you stick to the greenzone. Sign up for AWS account. Beware of the 750 hours free-use limit. Go to aws.amazon.com and click on “Sign up”. Next you will have an Identity verification through cellphone, which consists of being contacted by an automated system that prompts you to enter the PIN number they provided you. After that, it may take while until your account is actually activated. Click on “EC2 Virtual Servers in the Cloud”. You will land on the EC2 Dashboard. Right in the middle click on “Launch Instance”. Then Select “Create new”, enter the name of your new Instance (i.e. VM) and select for instance an Ubuntu, to make sure you stay on the free-way. Nowadays you have two versions of Ubuntu Server available: 12.04.2 LTS and 13.04. If you are following specific tutorials with the previous version of ubuntu, then you might prefer to choose that one. Before hitting continue, make sure you click on the “Download” button. You will download a “pem” file (Privacy Enhance Mail), which is the certificate you will need to sucessfully establish a console session to that VM you’re about to launch. After downloading that file, hit “Continue”. On the next screen you will be able to confirm that the type of instance you are launching is a “t1.micro”. It is very important you do not change this, if you want to stick with the free experimenting. Hit launch. Your VM might take a few minutes until the orchestration on Amazon backend is completed. When the initialization is completed, right-click on your instance and select connect. Select “Connect with a standalone SSH Client”. You will have instructions provided by Amazon there. Make sure you copy the command line provided by Amazon, and launch a terminal session. In Windows I suggest you use Putty. If you’re using a Mac, just go to “Applications > Utilities > Terminal”. On Mac: Now this part might be a little more tricky if you’re not used to CLI. You need to change the permissions of that “pem” file you downloaded, so change to the directory where you stored the pem file (Usually “Downloads” directory), and change permissions. Enter the following lines, where the text contained in each quotes is a different line: “cd ~/Downloads” , “chmod 400 name-of-the-pem-file-you-downloaded.pem“. On windows: follow this tutorial to connect with Putty. There! You should have a Welcome page in your terminal console from Ubuntu. Now its time for experimenting things. Why not start with a LAMP?